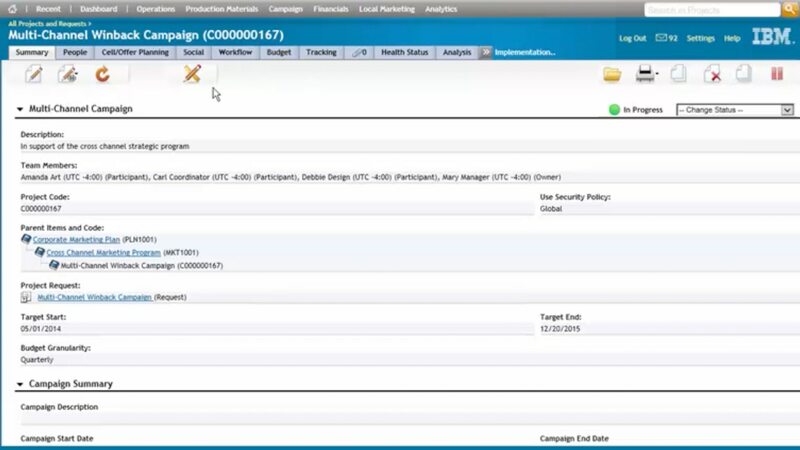 Increase productivity by integrating planning and campaign execution. Managing the full offer lifecycle to create, approve, publish and retire assets. Boost the effectiveness of cross-channel programs and improve collaboration among marketing teams for better overall business development. See how your actual marketing expenses are impacting business results. Quickly assess and reallocate resources to move funds from under-performing initiatives to successful ones. Save time and cost by decreasing duplicative efforts of external agencies and other vendors. Leverage the powerful set of financial management tools to define budgets and budget versions, and compare them before finalizing performance objectives. Over the course of a project or program, adjust budgeting plans as needed to understand the impact of increasing or decreasing spend. Manage your digital assets with custom attribute tracking, graphical views and version control for maximum security and confidence that the right asset will be used for the right purpose. Benefit from a common user interface with dashboard views of information across product lines. Remove the bottlenecks in your processes when key resources are out of the office. Use out of office (OOO) settings to automate reassignment for either new tasks and approvals or for ones currently assigned. Choose from options to automatically delegate all tasks or approvals, selected ones, or none. Marketers and project managers often want to leverage prior projects or portions thereof. An example is the need to copy a project that was used for last year’s ABC marketing campaign for use for this year’s ABC campaign. Copying projects is now possible with the configurable options helping promote best practices across the organization while saving the team considerable time and reducing errors. Alerts can be managed to a granular level, helping users better plan their workload. Due dates are displayed upon project request review as well as in the request alert itself. Choose the deployment model that fits your enterprise needs and goals. Choose from going fully to the cloud and hosted or deploy on-premises for in-house environment and application management. Optimize what offer to send your contacts and when for maximum return.